WASHINGTON, D.C., September 11, 2018 — Epidemiological studies have established a strong correlation between inhaling ultrafine particles from incomplete combustion and respiratory and cardiovascular diseases. Still, relatively little is known about the mechanisms behind how air particulates affect human health. New work with carbon nanodots seeks to provide the first model of how ultrafine carbon-based particles interact with the lung tissues. An international group of researchers created a 3D lung cell model system to investigate how carbon-based combustion byproducts behave as they interact with human epithelial tissue. In Biointerphases, an AVS journal from AIP Publishing, the investigators discovered that the surface properties of the carbon nanodot's properties and aggregation patterns affected their distribution in a lab-grown copy of the lung's barrier layer, the epithelium. The carbon nanodots served as representatives for air pollution particles. "Localization and quantification of inhaled carbon nanoparticles at the cellular level has been very difficult," said Barbara Rothen-Rutishauser, an author on the paper, which is part of a special focus issue of the journal Biointerphases on Women in Biointerface Science. "We now have a model fluorescent particle that can try to answer questions about the fate of ultrafine particles in the lung." At less than 100 nanometers in diameter, ultrafine particles have the small size and large relative surface area to wreak havoc on cells and potentially enter the bloodstream. Other groups' research has shown that ultrafine particles induce adverse effects on the lungs and cardiovascular system by increasing oxidative stress in the body. Since regular fluorescent microscopes lack the resolution to visualize such small particles, the group used spectroscopy and UV light to detect and quantify nanodots as they migrated from the luminal compartment past their lung model's immune cells. As the researchers expected, charged particles tended to stick together before penetrating the gas-exchange barrier. While most of the neutrally charged nanodots passed through the tissue after only an hour, only 20 percent of the agglomerated charged particles infiltrated the epithelium. Rothen-Rutishauser said she hopes to further improve nanodots so that they better mimic ultrafine particles. "What we're seeing is that translocation depends on aggregation state," Rothen-Rutishauser said. "We hope to continue trying out different sizes of nanodots, including other types of particles that get us closer to the real environment." 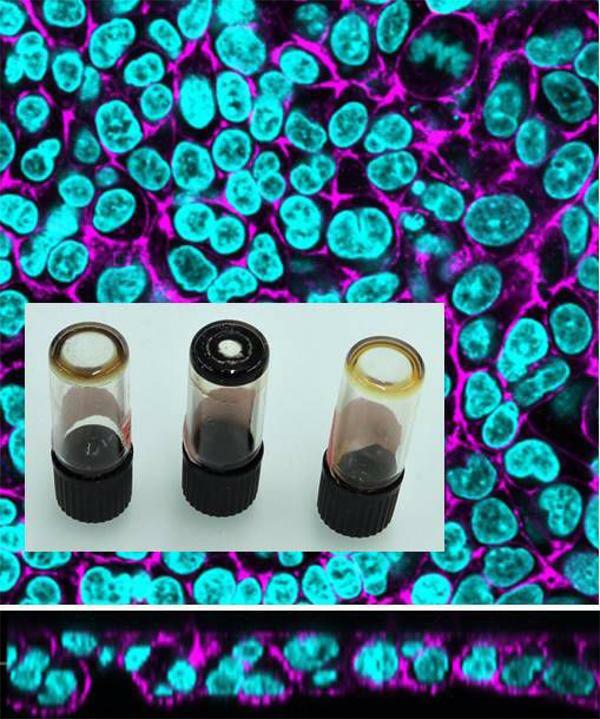 The article, "Carbon nanodots: Opportunities and limitations to study their biodistribution at the human lung epithelial tissue barrier," is authored by Estelle Durantie, Hana Barosova, Barbara Drasler, Laura Rodriguez-Lorenzo, Dominic Urban, Dimitri Vanhecke, Dedy Septiadi, Liliane Ackermann-Hirschi, Alke Petri-Fink, and Barbara Rothen-Rutishauser. The article appears in Biointerphases Sept. 11, 2018 (DOI: 10.1116/1.5043373) and can be accessed at http://aip.scitation.org/doi/full/10.1116/1.5043373. The AVS journal Biointerphases emphasizes quantitative characterization of biomaterials and biological interfaces. As an interdisciplinary journal, a strong foundation of chemistry, physics, biology, engineering, theory, and/or modelling is incorporated into originated articles, reviews, and opinionated essays.